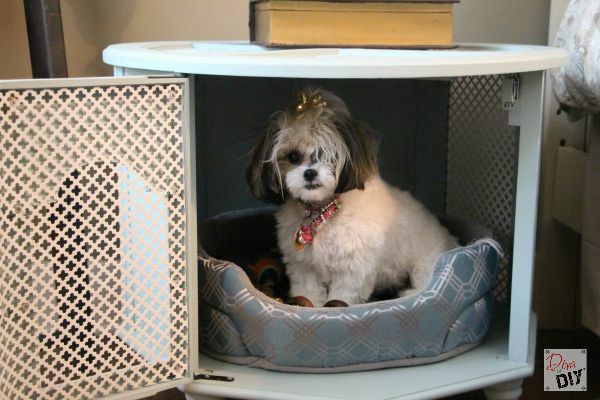 Let’s face it…most pet crates/kennels are ugly right? I mean seriously…who want’s to try and incorporate an obnoxiously large, overpriced black metal fence into their decor? 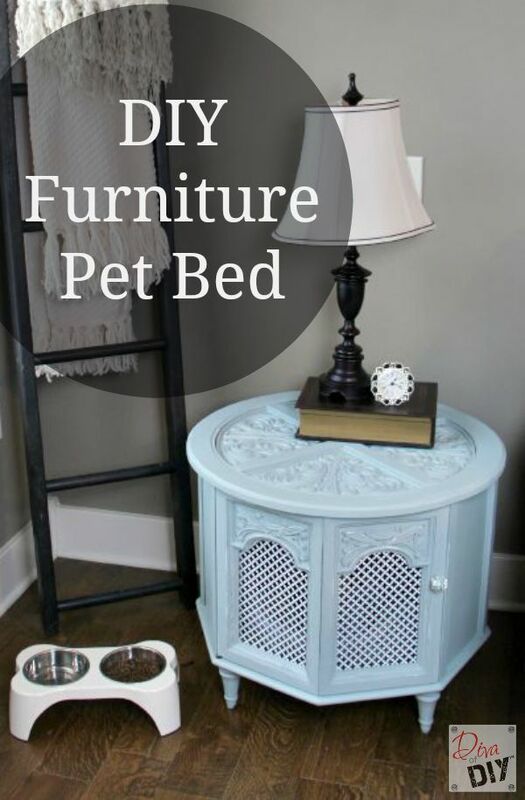 As amazing as that sounds (NOT), I opted for another option…a furniture pet bed. I had a vision of what I wanted Stella’s pet bed to look like. 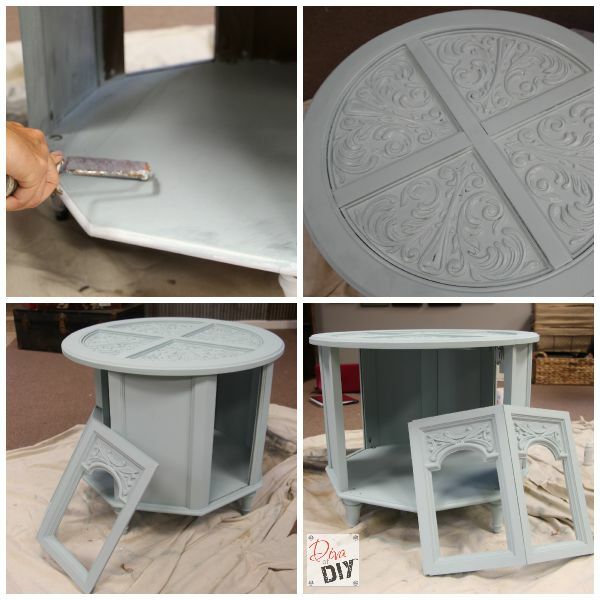 With some elbow grease, a little tool know-how and DecoArt Chalky Finish Paints, I was able to accomplish the exact look I was going for. 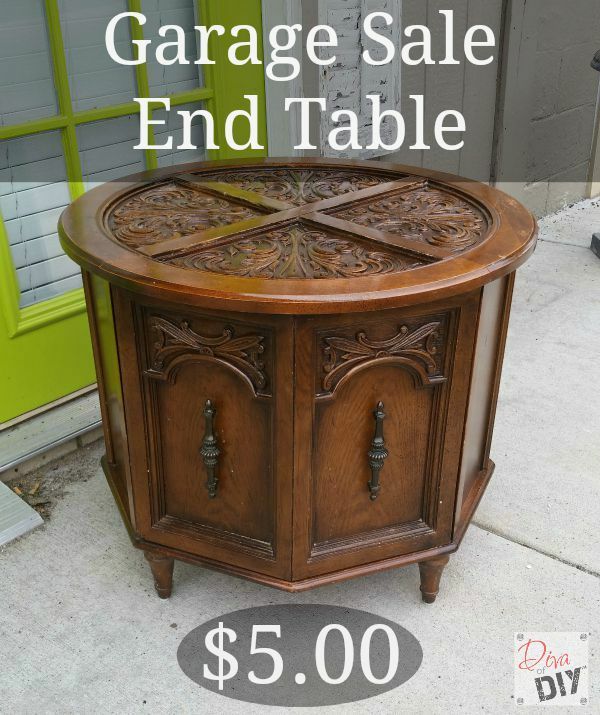 I found this end table at a garage sale for $5.00. 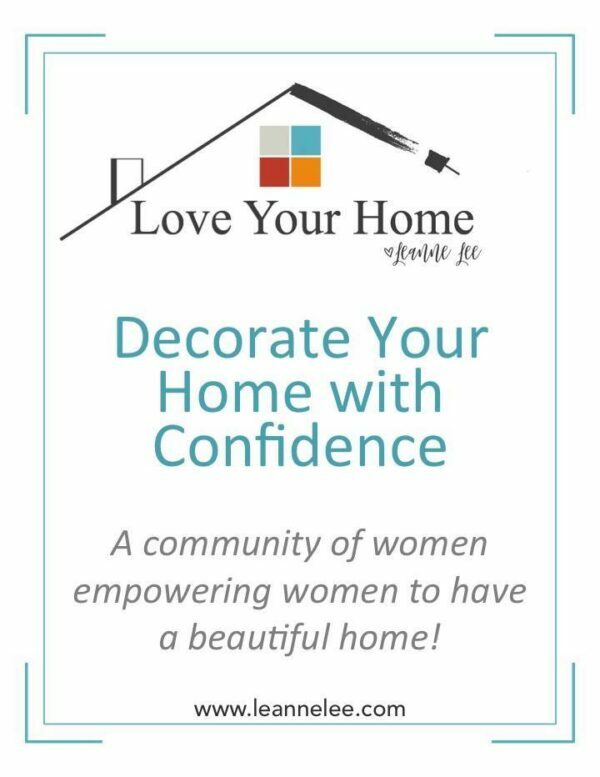 At the time, I wasn’t sure what I was going to do with it but I knew it was going home with me and…like many “can’t pass them up treasures”, it went in my storage area until the perfect project came to mind. 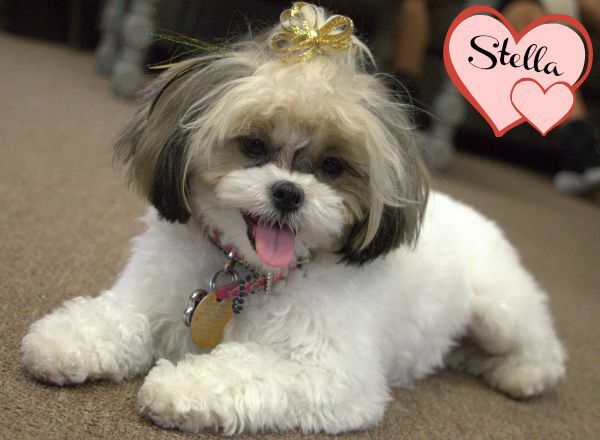 Meet Stella-Roo, my 1-year old Shih-poo. I decided to make her a dog bed/kennel that would also double as a night stand in my bedroom. 3) Remove hardware and place in a baggie for later. 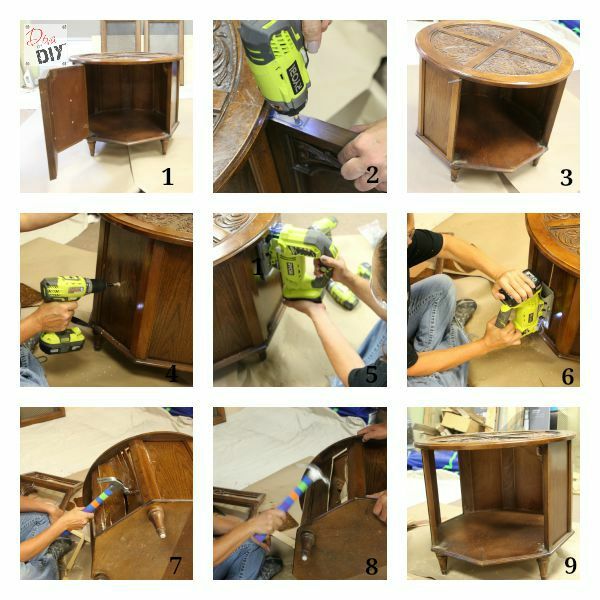 4) Using a drill and 3/8″-1/2″ drill bit, drill a large starter hole in the side panels you are wanting to remove. 5) Using the jigsaw and a wood blade, start the jigsaw in the starter hole and cut straight up to the top. 7) Take a hammer and break out the 2 pieces of the panel. 8) Repeat on other panel. 9) Now that the side panels are removed, you can start working on the cabinet door. 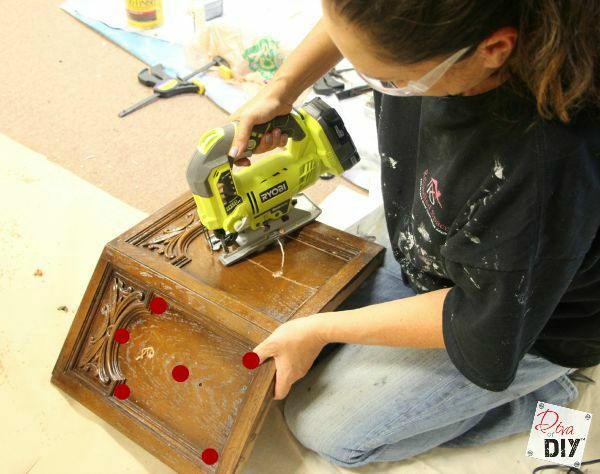 10) Take the drill and drill bit from above and drill in the red highlighted areas on the door panel. 11) Use the jigsaw to connect the dots. Remove entire center panel. Repeat on other side. 12) Lightly sand with 220-grit sandpaper. 13) Clean with Krud Kutter and a soft rag. 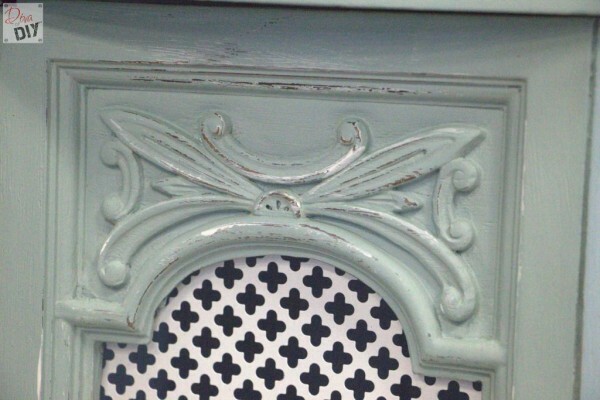 1) Paint all of the edges, corners and the entire top piece of the cabinet in the DecoArt “Everlasting” Chalky Finish Paint. Let Dry. Apply a second coat if necessary. Let dry. 2) Lightly buff with 220-grit sandpaper to test adhesion and knock off any rough edges. 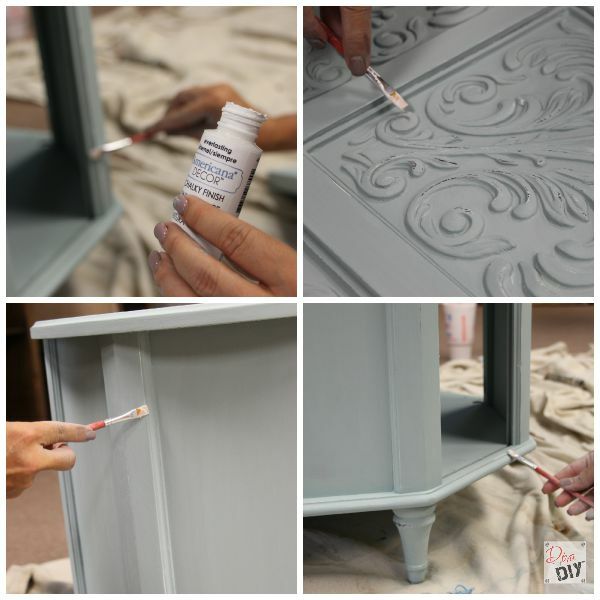 4) Paint the entire piece, including the inside in the DecoArt “Vintage” Chalky Finish Paint. Let dry. 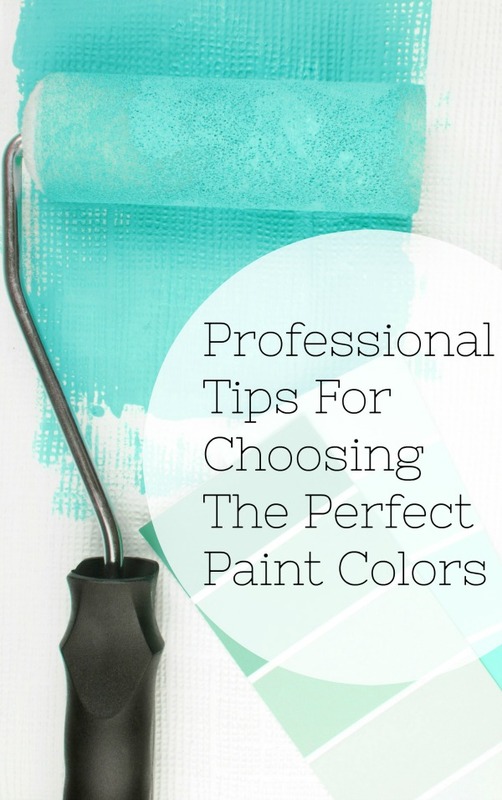 Repeat with a second layer of the same color. Let dry. 1) Dip a 220-grit sanding sponge (or fine sanding sponge) into water and lightly wet sand to expose the “Everlasting” Chalky Finish Paint from underneath. 2) Lightly buff the entire piece with the damp sanding sponge for a “smooth as silk” feel. 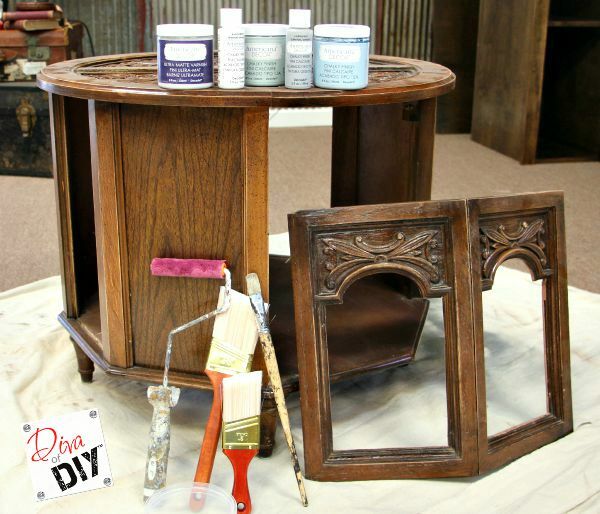 Diva Tip: For added dimension, expose some of the original wood by using the 220-grit dry sandpaper to burn through both paint colors. 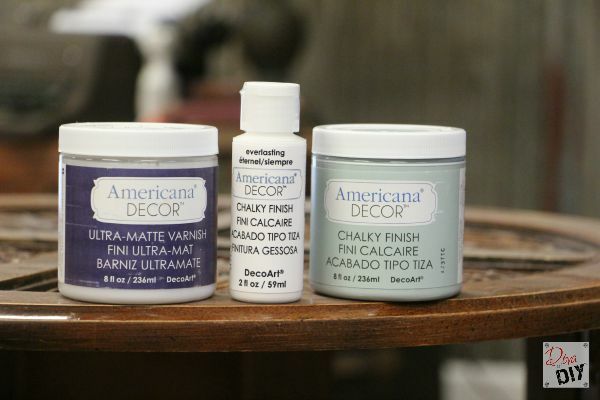 Using a small artists paint brush and the DecoArt “Everlasting” Chalky Finish Paint, highlight some of the edges and corners to make them pop. Here is a picture of the detailing up close. You can see where I sanded back the edges…some to white and some all the way to the original wood. You can also see areas where I tipped it with the white on top. Because I was making this a furniture pet bed/kennel, I wanted there to be air circulation inside the cabinet. I remembered using decorative sheet metal in my “Make your own DIY jewelry holder” project and thought it would work perfect for this project as well. 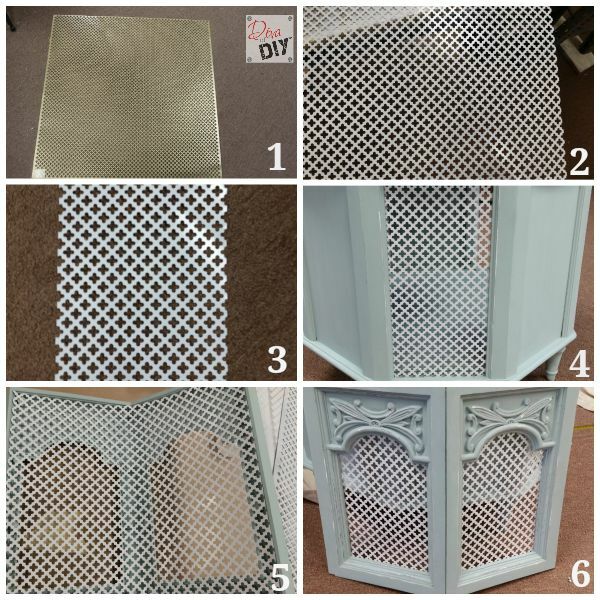 The decorative sheet metal only came in silver, gold and bronze…all of which I thought were too harsh for my cabinet color so I spray painted it in Rustoleum gloss white spray paint. Once the spray paint was dry, I measured the openings and cut the sheet metal with tin snips. The sheet metal easily slid into the slots where the old side panels once were and as for the cabinet door panel…small wood screws were just the ticket to hold it safely into place. All that was left to do was topcoat the cabinet with 2 coats of DecoArt Ultra-Matte Varnish. Let dry. 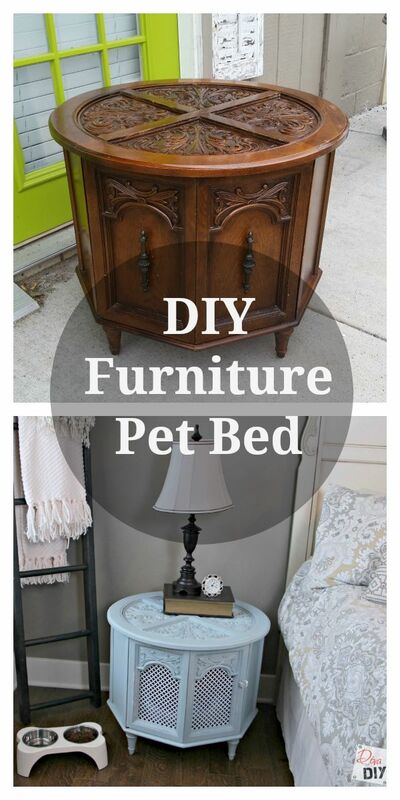 I honestly couldn’t be any happier with this furniture pet bed project. It makes me happy to know that Stella is safe and secure sleeping right next to me at night and I love the fact that her bed/kennel looks like a beautiful piece of furniture instead of an eyesore. Here is another picture of Stella-Roo in her new bed. I think she approves…don’t you? I did that too, with the same kind of table, but I took the doors off and used velcro to attach a cushion I made to the flat top. Now it's a dog bed slash foot stool. I like tall foot stools, so this worked perfectly for my purposes. I painted it cream outside after roughing up the wood veneer and bright raspberry pink inside. 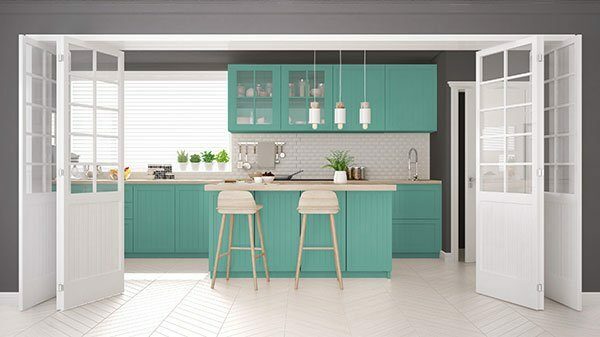 I love the detailing on yours and the modern color! Thank you so much Erin. I would love to see a picture of yours. 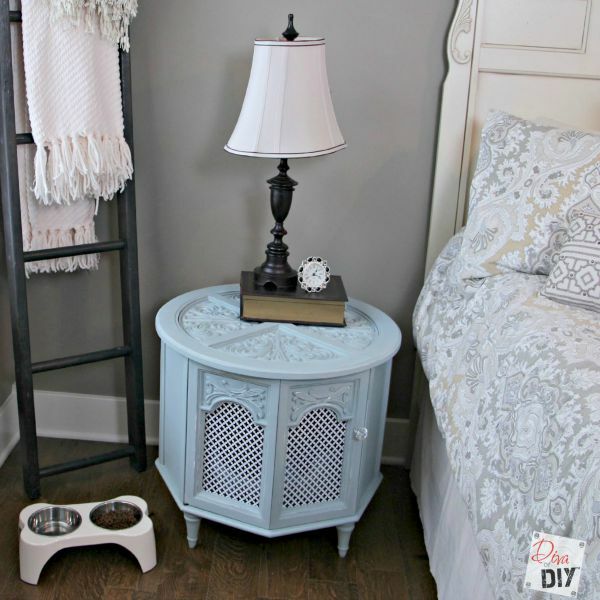 It sounds awesome...i love the footstool idea. Thanks Karin. As far as Russ...it would be worth trying to fit him in there just for the pictures!